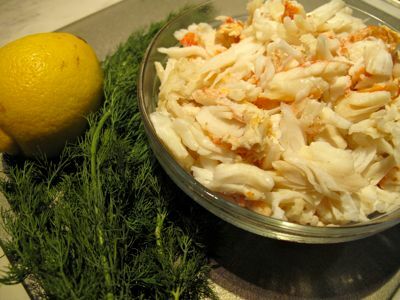 The next day, we extracted the crab meat and shredded it a bit (note how much bigger the chunks of crabmeat are when compared to local fresh crab meat) and added some mayonnaise, lemon, dill, a touch of mustard, salt and pepper for a quick and simple appetizer. This would also make an extravagant filling for a croissant sandwich with a bit of tomato and some lettuce… The crab legs weren’t cheap at PHP1,300+ a kilo or so, but they yielded an incredible amount of edible meat, so you would have to buy several kilos of local crabs to get an equivalent amount of meat. Edwin, besides being my suki for romaine and other greens, capsicums, asparagus, etc., now carries alaskan king crab, some almost wagyu quality beef, and other goodies. Fresh Field is located in the market area of the mall, near the Ineng’s barbecue stall. MM, smart word play with the title of the post. When you said ” I was a bit sceptical..” should be skeptical. Thanks for the info, MM. I learned something on April Fool’s Day. I hope I’m not being a “pain”. That TV show would be “The Deadliest Catch” – I’ve learned that one of the captains (I think it’s boat Cornelia) just died earlier this year due to health complications. They are expensive though but I think I’ll try this recipe. Thanks MM! oooh! i love it. its something i miss. sometimes, you just have cravings for crab legs, just those. not care about the body. haha how much does it cost though? oh, i am so craving. sadly, its maundy thursday and its probably closed till saturday. yep, love that show too, MM. and yep, it was Captain Phil of the Cornelia Marie that passed away recently. just looking at those gigantic waves makes me nervous at travelling by sea already, but thankully, we don’t have that kind of waves here in the Phils. crabs… hit me with crabs anytime. lol. love crab meat fillet served on a sizzling plate with vegies. makes me want to go to Pala-Pala and buy crab meat by the “baso”. lol. That is cheap. The price I saw at Costco yesterday was $14.99/lb. 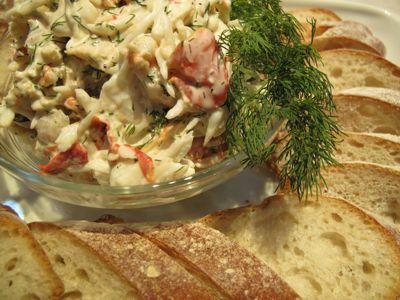 Ang paborito ko sa Deadliest Catch, siyempre, si Sig Hansen ng Northwestern…not so keen on crab salad though, but I would love to try crab meat on very hot pasta. that was a good deal MM. here in vancouver, alaskan king crabs are currently in season. we have this fave resto in richmond that sells this live crabs (they keep them in a big aquarium) at $9/lb, the smallest you can get is 10 lbs. they cook it mostly 2 ways, one is steamed using the legs while the other is deep fried with rocksalt and chilies (among others). it is sooo good! although you can buy the frozen legs from costco, it is somehow a little diff than the fresh ones you get from the resto. true, the flesh is sweeter than the regular crabs. sorry for the long comment. we’re heading to that chinese resto again this weekend. Wow, there are a lot of “Deadliest Catch” fans right here. I was a crab buyer in Dutch Harbor, Alaska for 12 years so I am very familiar with Alaskan Crabs. You name it, King Crab (red, brown and blue), Snow Crab (opilio and bairdi) and Horsehair Crab yes there’s hair on it and it’s my favorite – juicy and tasty. Hope Silly Lolo will not react to this, remember Holy week ngayon. I also met pretty much all the crab boat captains whenever they offload their catch in Ducth Harbor and St. Paul Island. It was like really crazy when I heard stories/experiences from the “deckhands”. That’s true, Capt. Phil Harris of Cornelia Marie passed away last February. He was a tough skipper and great person. His sons, Josh and Jake will miss him dearly. @atbnorge, there was a couple of Norwegian Crab boats in Alaska when I was there, Pengwin and Isafjord, does it sound familiar to you? MM, you don’t need to steam the crab legs it’s gonna get dry. Just thaw it and serve. I wonder if your suki gives instruction how to use king crab legs. Steaming is a no-no that’s for sure. the title made me do a double-take—–remember your GYN appointments, ladies..
Big Al, thanks for those tips, didn’t realize it didn’t require steaming. I was afraid of potential cooties so I did a quick steam, but you are right, it was a little dry. zoi, I am sure fresh taste much better than frozen. Hmmm, but killing and dismembering one must be a little challenge, no? pinkytab, yikes, that’s pricey considering they come from the states… though I did read an article that quite a bit is now caught by russian ships/trawlers and they are bringing the prices down. funny how so many people seem to be watching this “Deadliest Catch” program… you guys even know the captains et al! naughty title, MM ;-) ….and on Good Friday at that! I have so much more appreciation for those snow crab legs sold at the grocery & respect for the hardworking captains & crew after having watched several episodes of Deadliest Catch. There’s another series I find interesting, Man Vs. Wild. 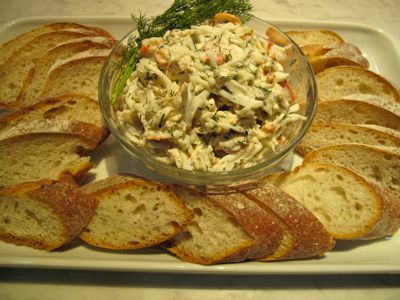 Thanks for the crab tips & recipe. @Big Al, I am not familiar with those boats, but they do sound Norwegian. They are probably from the northwest coast of Norway and I live in the southwest. I love fishing programmes, I also sometimes love to fish and end up opening a tin can of fish soup; the cods won’t bite! Hi MM, where is your suki in Fresh Fields exactly in Market! Market!? What other products does he offer? Thanks! Hi MM, have you ever eaten those Batanes Coconut Crabs, i’m just wondering if they are much better tasting than those Alaskan King Crabs.